I'm not really a resolution-phile, I for example am totally happy with 1080p. One thing I know for sure about the F3 is the super low noise image that so far has appeared very sharp. What I can also say about the FS100 is that NONE of the sample videos from the prototype have looked as good as the F3. That's fine I suppose because it is so much cheaper but doesn't really make me want to run to B&H and preorder a FS100. I keep waiting for that one video that shows the FS100 being great. I got that early on with the EX1, it was apparent right away that is was beautiful. Same thing with the F3. I'm not sure one needs to be a "resolution-phile" to understand the advantage of a very wide bandwidth signal. There are many reasons why one does not want to shoot and record at the same resolution as one is exporting. Likewise, there are many reasons why one wants to record compressed RAW or Log-S. If you want to see why Sony has built the F65 fort filmmaking -- watch this video. It's about the RED Epic, but when it talks about IMAGE QUALITY it says everything Sony would say about why you really want an F65. Except, of course, that the F65 does it better! It seems the F3 may hit a sweet spot the FS100 does not, for me. Last edited by Piotr Wozniacki; April 14th, 2011 at 02:17 AM. Are the captured pixels contiguous -- meaning are columns and/or rows dropped from the pixels on the chip? If not contiguous -- what is the skipped/discarded ratio? When pixels are skipped/discarded chroma aliasing results. Very not good for the F3 at it's high price. And, obviously demo material will have been carefully chosen to not show aliasing. Moreover, since we know the capture aspect ratio is 16:9 -- what is the aspect ratio of the chip? What are the Effective and Gross pixel counts? This simple information has never been hidden before. Why now? Imaging Device: It's got a BIG chip that's "Super" and yet not as big as "Full." - why "skipped/discarded"? Why not "accumulated"? You're in Vegas, right? Why don't you come to my 10:00 - Noon workshop in room N102 (just a few yards from Sony's booth) on Wednesday morning. I'll show you some footage on a 20' screen that rivals the F3 -- plus some comparisons of different bit rates with external recorders, etc. It will be worth your time. The workshop covers the F3 and FS100. Would love to see you there. Could you confirm the HDMI out specs for us. I saw the interview with you on Vimeo where you stated and they later confirmed that it's 4.4.4 but looking at the Sony website it says 4.2.2. Either way I think this will be the camera to beat this year especially when you combine it with an external recorder. The HDMI output of the FS100 can either be 4:4:4 8-bit or 4:2:2 8-bit. The external recorder and the camera will shake hands and determine automatically what is the highest possible setting they can share. No need to change any menus. Also, the HDMI output has embedded timecode. Not sure how exactly that will be used right now in the real world. FYI, I could not get the TC to trigger recording on my NanoFlash the way it does with SDI. In the future I'm sure it will. This should answer a lot of doubts presented by Steve, and those created in our minds by the review of BBC's Alan Roberts. I find it strange the choice 444 hdmi as there are no recorder for that and none that I have heard planning for it. For the little gain for 99% of shooting of 444 vs 422, a 10 bit output should have been much better and made a whole lot of differences. Last edited by Steve Connor; April 14th, 2011 at 03:49 PM. Reason: Posted on wrong thread! Does this mean the F3's HDMI can be 444 as well? Man, Sony is really confusing. Why provide 444 in HDMI when there isn't any hardware that can take advantage of it? I just checked BlackMagic and Aja and everything is 422 YUV over HDMI except a BM Mini Converter which is an HDMI to SDI converter. HOWEVER, even though it can accept 444 RGB over HDMI, it can only output 422 YUV via SDI. 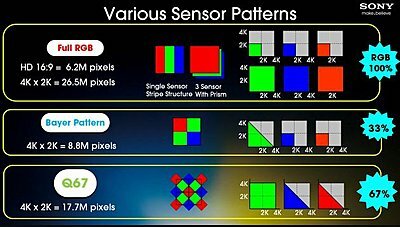 "We're grossly oversampling for HD, and we're not allowed to say the specification of the sensor, but I can say that we are grossly over-sampling high definition"
I'm sure everyone wishes that cleared everything up. But, alas it doesn't. Pretend you are an intern at Sony and told IF you can do the following, you get a job. 1) You can't use the 14MP sensor used in current NEX cameras and camcorders. (This let's us claim the FS100 doesn't use the same chip as the VG10.) You must use the Sony CMOS sensor used in the A55. It is a 16MP chip. It will be used in 2011 NEX cameras. 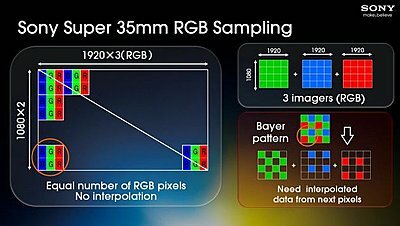 When shooting a 16:9 image, the chip uses 4912 by 2760 pixels -- a total of 13.56MP. 2) You may use the current Bayer filter or you may use a different one. 3) The chip must output a pixel that is "effectively" 4X larger in order to increase performance. 3b) Noise must be lowered by 6dB to 9dB. 4) In order to run the chip at 60Hz rather than 30Hz, data coming from the chip must be reduced by half. This must be done without skipping or discarding. 5) You must obtain a 3.36MP before debayering. That means 4912 columns must become 2456 -- actually 2444 pixels per line. And, 2760 rows must be reduced to 1380 lines -- actually 1374 lines. 6) You must explain what that pesky BBC guy will find when he tests the F3 or FS100 for aliasing. Before I post how I think this can be done, let's see if others can design the F3/FS100 chip. PS: Bonus points if you can show the chip could be used for a 4K2K VG20. Contest closes on Saturday night. Last edited by Steve Mullen; April 15th, 2011 at 05:17 PM. Sorry we can't tell you the chip spec. -- like why? -- but we will tell you we record 2MP and the pre-debayering image is 3.36MP. First, most single chip cameras need about 3.3MP so that after debayering one has 2MP. I've never seen these necessary pixels called "oversampling." Second, I don't know what Juan calls "gross" but I sure don't call 68% (1.68X) gross. Now were a chip to have 6.78X more photosites -- yes, that would be gross. But, depending on how the "reduction" is made, I'm not sure I would call it over-sampling. Last edited by Steve Mullen; April 15th, 2011 at 11:06 PM.